This spring term at school I decided to take a drawing class to give me a break from the more scholastic classes I’ve been taking. Overall, I have been enjoying the class. It allows me to detach myself from my other classes for a few hours a week while learning a new skill. What I enjoy most while drawing is trying to capture an item/image/whatever to the finest detail, and being able to create something interesting and be constantly improving. One of my recent assignments was a self portrait, we were asked to bring a small, handheld mirror to class for this, however, I forgot. So, for this assignment I was using the back of my phone, which gave a very soft reflection. This made it fairly difficult to capture any minute details. Another aspect of the drawing was that I was doing it in sections, which led to some distortion, but helped to conceptualize things differently. Although my drawings are anything but exceptional, I take pride in the fact that I can produce them at all. I never considered myself an artist, but maybe, may be in my future. Here is the finished portrait, enjoy! 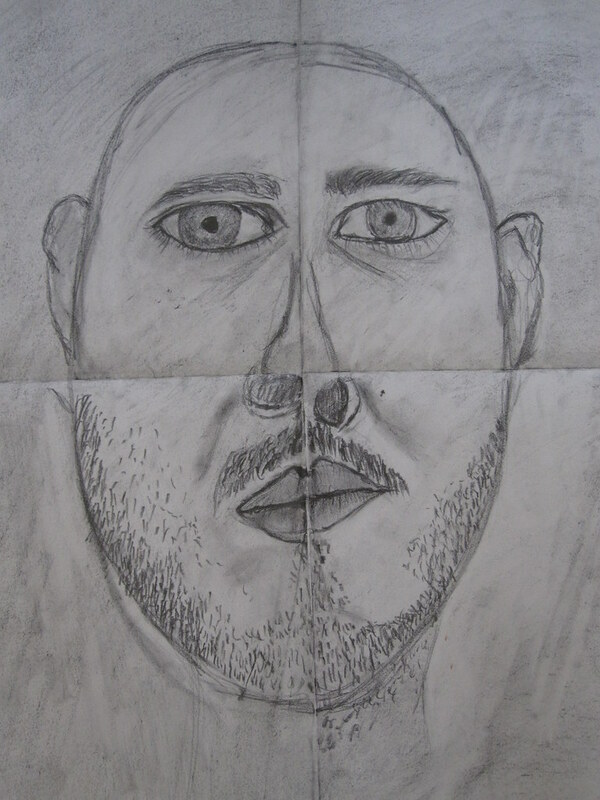 This entry was posted in art and tagged 18x24, art, charcoal, drawing, fun, school, self portrait, sketch. Bookmark the permalink.